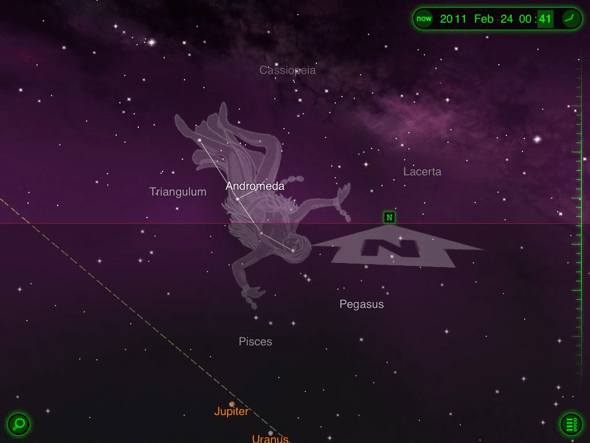 Star Walk is an app for the iPhone and iPad, created by the same company who brought us Solar Walk. It acts as an interactive astronomy guide, allowing you to hold up your device towards the sky and see where all the stars are in real time on the screen, thanks to the built in GPS and accelerometer of your phone or tablet. When you first open the Star Walk iPhone & iPad App, you’re presented with a bundle of information regarding when each planet will rise and set in the sky, as well as where the sun will rise and set at your current location. You can use the time line at the top of the screen to see when the sun rises and planet rises change throughout the year, although you will have to manually use the arrows at either side of the time display to do this, as there is no quick way of zooming through time, unfortunately, not at this screen anyway. Once you exit out of the initial screen, you will see a virtual sky filled with stars and constellations. If you’re outside at this point, preferably at night where, well, you can actually see some stars in the sky, it may be an apt time to find a nice comfy section of grass and relax for a while. Anyway, back to reality for a second, and you can also take advantage of some pretty awesome extra features built in to the application when you’re not in the middle of a romantic evening. If you’re interested in all the pictures that are captured by the telescopes that NASA and other space organisations have set up around this little planet of ours, you may enjoy taking a look at the picture of the day. You will find some absolutely stunning photos as well as artist impressions here, and if you find any that tickle your fancy, you can download them to your device, share the photos with friends or even print them using AirPrint in iOS 4.